Savannah, GA is such a large city, which makes it difficult to find a place to have your next meeting. If you are in search of a great meeting place, let us help you! From a convention to a private party, Savannah International Trade and Convention Center is the perfect place to hold your event! Plus, The President’s Quarters Inn is located right around the corner, giving you easy access to the Center. Here is all you need to know about the Savannah International Trade and Convention Center. The goal of the Savannah International Trade and Convention Center is success. They want you to have the best experience possible! The experienced staff will work with you throughout the entire process to make sure you have a memorable and successful event! 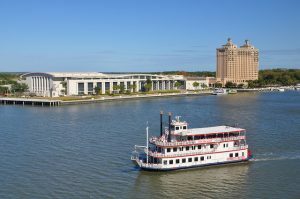 When you hold your meeting at the Savannah International Trade and Convention Center, an Event Planning Guide is provided with useful information on the Center’s polices and procedures. Find out more at the Savannah International Trade and Convention Center information page here! The Trade Center provides you with a list of vendors that will help you organize a flawless event. 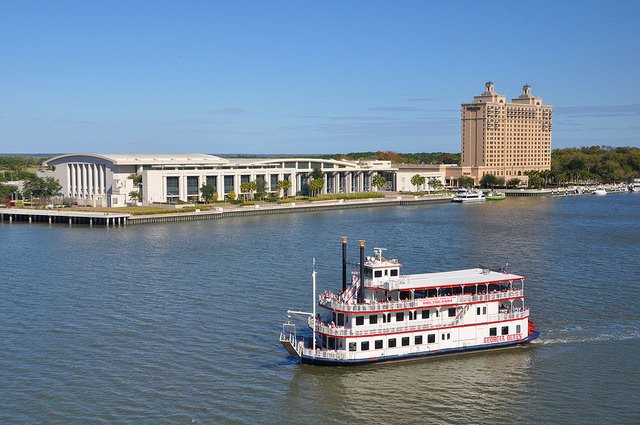 The Center has worked with some of the industry’s leading providers of meeting and event services, not just in the city of Savannah, but also nationwide. Click here to see the list of vendors! Internet service is provided through the Center’s venue partner CLD Networks. You simply need to complete the order form! The center also provides an exclusive in-house security, which is maintained 24 hours to ensure your safety. 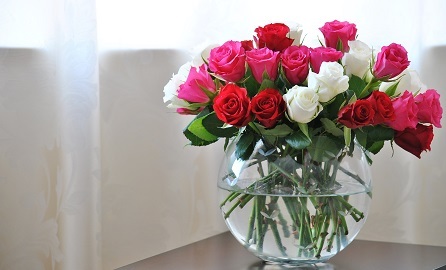 Find out more about all their services here. With some of the finest cuisine in the Low Country, you won’t be disappointed by SAVOR… Savannah Catering! The distinguished chef of SAVOR is sure to bring you the finest southern food, using the freshest local food to create her masterpieces. Whether it is a reception for a small group or a large reception, SAVOR… Savannah will serve up the most scrumptious food! As the Savannah International Trade and Convention Center’s exclusive food service contractor, SAVOR… offers several culinary options. The Savannah International Trade and Convention Center holds an array of events. One special event is weddings. Cherish your day in one of the exclusive event spaces at the Center. The romantic and private venue is perfect for either a traditional affair or a modern celebration. 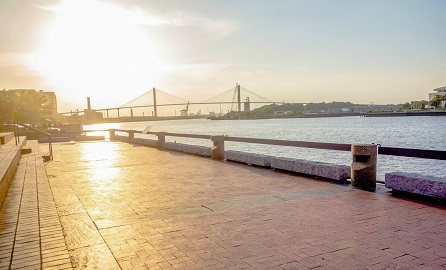 Your guests will be in awe of the panoramic view of historic River Street, the restored waterfront and the beautiful backdrop! The esplanade and river plaza is fantastic for any occasion! The venue overlooks the amazing coastal scenery, which is perfect for an evening affair. Savannah’s temperate climate is ideal for an outdoor affair; however, the ballrooms are a gorgeous alternative. 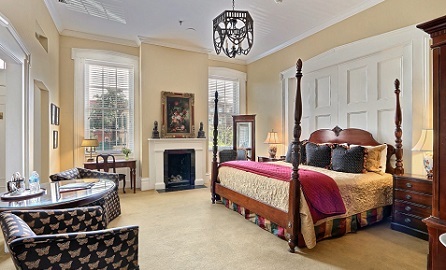 After your successful event at The Savannah International Trade and Convention Center, stay at a classic Southern bed and breakfast in the heart of historic downtown Savannah. The Inn is the perfect place for guests to stay at during all the festivities! The President’s Quarters Inn offers 16 luxurious rooms to relax in after a long and exciting day. All the rooms are named after former Presidents of the United States who have visited Georgia’s first city. 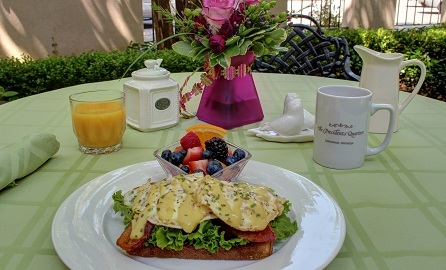 Plus, your stay includes a delicious breakfast. Book your room today!